Address : Kilmantin Hill, Wicklow Town, Co. Wicklow, Ireland. Welcome to Wicklow Gaol, not all of the prisoners left! Learn why Wicklow Gaol is world-renowned as Ireland's most haunted building. Located in the heart of the city, this 1980s vintage (but in the process of modernisation) centre is home to a huge number of shops spread over several one level malls, which between them host an enormous selection of products and services. Wicklows Historic Gaol an ultimate interactive journey through two centuries of prison life .... Holographic projections of cruel prison guards, the sound of the defiant cries from the 1798 rebels and the transformation of three prison floors to visually recreate over 200 years of Irish history through the eyes of the inmates . Wicklow's Historic Gaol presents a dynamic new visitor experience, complete with state-of-the-art audio visual enhancements. Designed to engage all the senses, visitors will step back in time as they journey through the original prison cells and experience a new era of life in Gaol as they move through the building. Descend into the dungeon and see the torture methods; climb aboard the replica transportation ship for an agonizing journey to Van Diemens Land; wander through the cells and meet the notorious protagonists of the 1798 rebellion and experience the overcrowding of the famine era, ascend into the Irish War of Independence and Civil War when Wicklow Gaol finally closed its doors as a prison for good. The new experience also includes audio handsets in four languages, interactive points for children and a genealogy centre for visitors. Bespoke experiences include evening ghost tours, overnight paranormal investigations, sleepovers in the cells, Birthday parties, anniversaries and events for other special occasions. This is both educational and fun - and it's all indoors, so doesn't suffer from climatic influences! 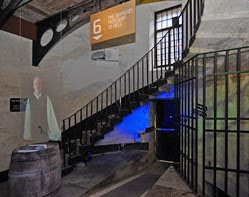 The spectacular newly refurbished Wicklow's Historic Gaol is open to visitors seven days a week. The Gaol Caf? serves a selection of hot and cold dishes, teas, coffees and baked goods throughout the day. 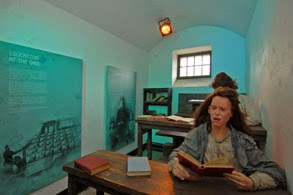 For further information see: www.wicklowshistoricgaol.com or call 0404 61599. T&C?s Tickets bought on line cannot be used in conjunction with any other offer, promotion or voucher or exchanged for cash. No refunds can be made. Photocopies are not accepted. A range of special tours are also available. These include Paranormal Tours and Night Tours. Find out more about our special tour rates on the Tours homepage.